Question: What is the first thing someone does after they purchase an Addams Family? Answer: Weep, as the price paid for it was probably astronomical. Then, if the game doesn’t already have one, install Uncle Lester. I’m guilty of immediately putting in an Uncle Lester as well. My TAF arrived last year at this time, fresh off of a container from Italy, and I had ol’ Lester pre-purchased ready for its arrival. I ask myself in retrospect, why was I so keen on getting him in? Mostly, it’s just accepted practice. A TAF without a Lester in a private collection, in my experience, is a rare occurrence indeed. Also, it’s pretty unobtrusive and easy to install. But look at it. Honestly, it’s very ugly. 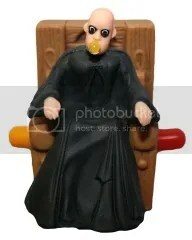 And it doesn’t look like Fester/Christopher Lloyd at all, but rather an emaciated nun with a ball-gag in her mouth. The lack of likeness, in all likeliness, has something to do with skirting copyright…much like the Lester name change. The arms of the figure shoot out at 90-degrees, not resting upon the arms of the electric chair as it appears they are designed to. Further, Lester isn’t “plugged into” anything—no headpiece to give him a jolt or arm straps to “secure” him in (the scene in the film where Fester IS in the chair both mentioned props are used). Food for thought–of the five completely restored and overhauled TAFs that Christopher Hutchins of High End Pins has posted for public viewing on his site, only one has the Lester mod included in the final restored product. That doesn’t mean that the other four owners won’t eventually add them to their beautifully restored machines, but it speaks volumes as to the opinion of the mod to a professional like Hutchins (and the folks with money who pay Hutchins to restore their machines). It could have something to do with restoring the machine back to “showroom original”—and Lester is obviously not stock. But that chair looks annoyingly empty without SOMETHING sitting in it! Granted, construction and wiring of the Lester mod, overall, is solid, and installation is a breeze. I’ve never had a problem with the figure coming loose from the chair even with continuous playfield raising and lowering (thanks to a malfunctioning “Thing Flips” 555 socket and a weak upper right flipper), nor in a bumpy move from my old house to my new one. But for all its durability, this is a mod that sits front and centre, inches from the flippers and it’s hard to ignore. So the question becomes what looks worse—an empty electric chair or a garish looking Lester? The mod itself has been through a few incarnations and available from a few sources over the years. 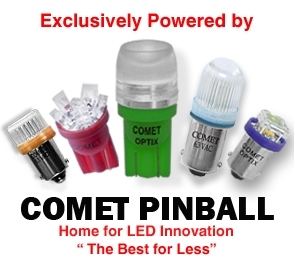 Currently, Lester is available direct from Pinball Pro for $89.95USD or through their eBay store (LINK) for $99.95USD+$8.99USD shipping within the US (international around $20US shipping). I say this with no real experience in manufacturing or economies of scale, but that strikes me as a bit pricy. But obviously it’s a price people have gladly paid to fill their electric chair. Other options appear to be limited. Another “Fester” was available from a seller in Spain–beautifully sculpted after the image of Fester on the backglass. I have not seen this one in person, so I can’t speak to the quality of the mod, but it looks to be quite impressive. As of writing, this new Fester cannot be located on eBay. Either production has stopped, or the mod is so massively popular and intricate to make that they can’t keep them in stock. The same seller also had a polar bear head that was sculpted after the polar bear on the playfield to mount above the Bear Kick ramp (don’t get me started on how absurd the game looks with a live, in-stride polar bear mounted above the ramp) and a mini-graveyard to mount near the pops (again, the absurdity of the other “mossy graveyard” mod also boggles my mind). 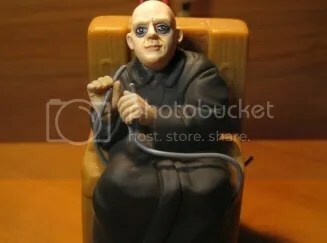 My recollection is fuzzy, but I don’t think there were any lit or moving parts on this version of Fester—it was a static figure that sat in the electric chair…and the price was around $230USD+$15USD worldwide shipping. I guess if they are charging $110 for an ugly Lester, $250 for an intricately crafted one isn’t outrageous. One can also surmise that this version is also unlicensed, infringing on the copyright of Paramount’s Fester character and the John Youssi backglass art. The licencing problems with TAF are well documented. The estate of Raul Julia (Gomez Addams) has prevented anything with Julia’s image from being reproduced for parts or in digital form from the moment Williams lost the production licence/Julia passed away. 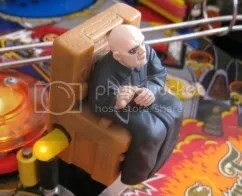 Can we assume that a company with influence, say, Planetary Pinball Supply, would be able to navigate the rocky terrain that is licensing acquisition to get a decent licenced version of Fester produced? There would be a market for it and I don’t think Julia’s estate would have to be involved. Without a doubt, TAF is the most modded classic era machine out there, behind only Twilight Zone. With over 21,000 machines produced and a burning desire from collectors to have the newest mods in their machines, it would be a home run. I’m sure it would be a pricy venture, and obviously the cost would be passed onto the consumer…but if it fell into the $100-$200 range and was of good quality, it would sell, no question. Until such a time, we all have to stand pat with old Uncle Lester or wait until his Spanish counterpart (Tío Lester?) becomes readily available again AND we get comfortable enough blowing another $200+ on a mod most of us have probably purchased a version of already. Pinside – SEEN THE NEW UNCLE FESTER MOD…?? Categories: Mods | Tags: Addams Family, TAF, Uncle Fester | Permalink.